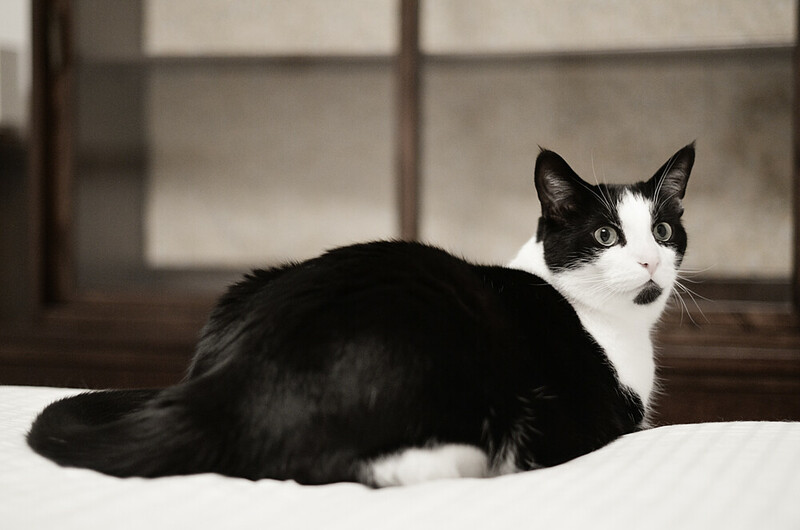 147/365 :: Sometims Farva will jump up on the bed and just start being really silly. There is a little rip in the duvet cover and he likes to attack it and then run all over the bed. It is so cute! 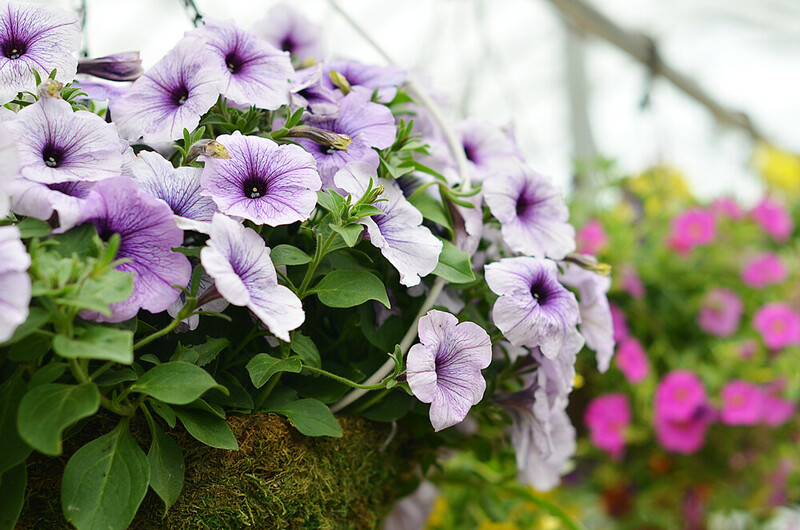 148/365 :: This is another photo from the garden centre the day my mom and I went to stock up on plants...which I still haven't been able to plant because the garden is too wet. 149/365 :: Ooops, Farva again. 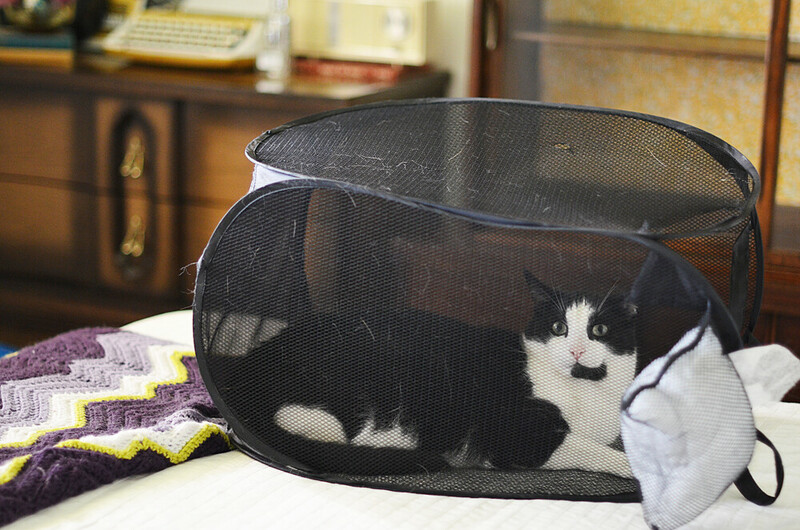 He also loves to lay inside the laundry basket when it is empty. 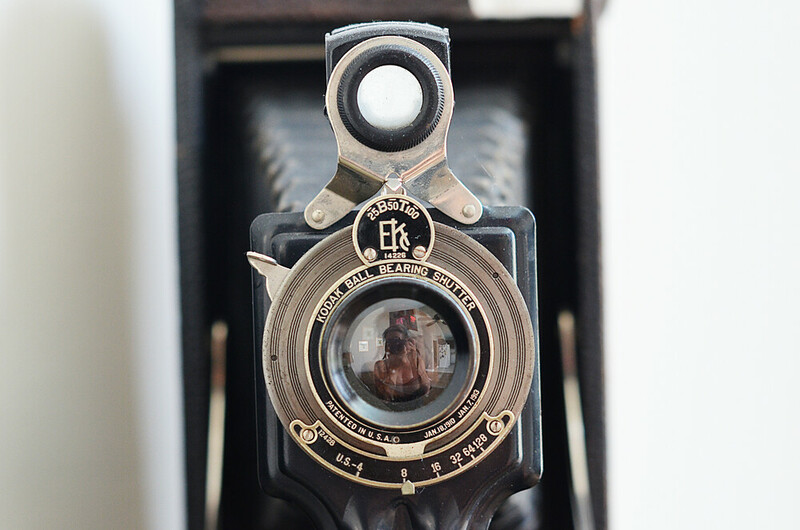 150/365 :: A cool camera at my mom's house. Do you see me there in the middle? 151/365 :: Our chives have flowers. I wish they stayed all summer. 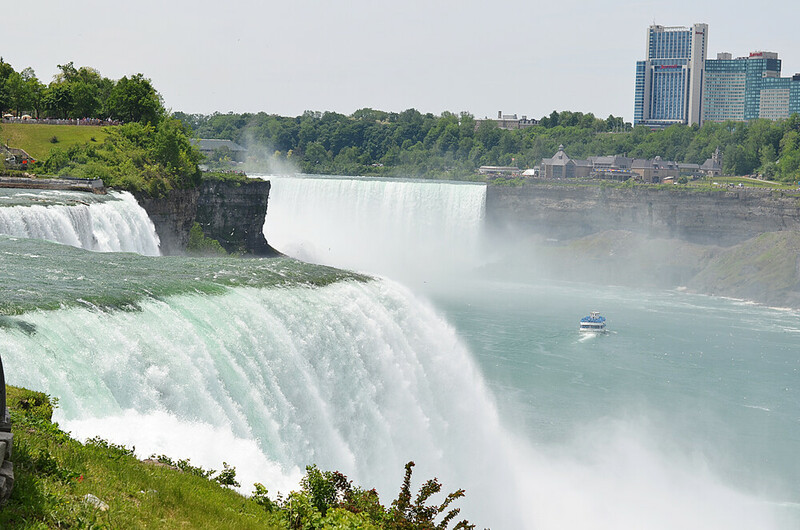 152/365 :: The Falls! I had never looked at Niagara Falls from the American side before. You get a better view from the Canadian side (I think anyways) but you can get really up close and personal with them from the American side. 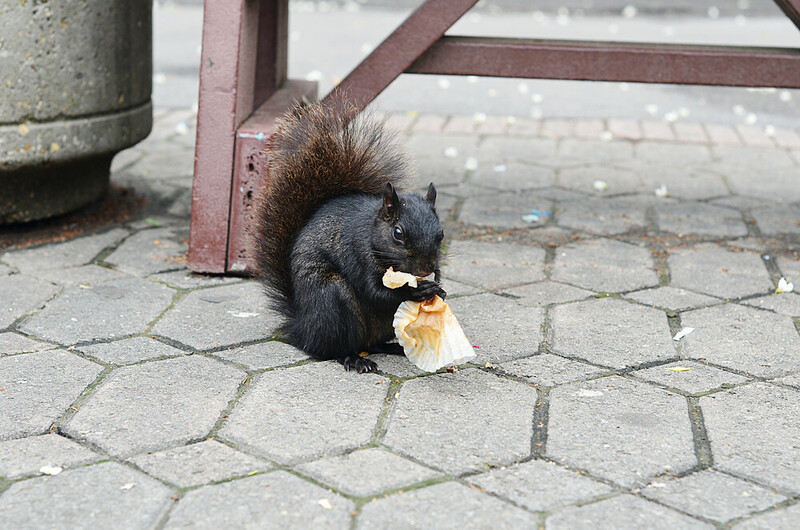 153/365 :: Kaylah and I spotted this squirrel friend eating a muffin wrapper while the boys were inside waiting for our food. He was the cutest little guy! I hope everyone had a great weekend. We had so much fun in Niagara Falls with Kaylah and Kevin...then we came home and instantly fell asleep. Being a tourist is tiring! I got tons of photos so I am off to look through/organize them. Have a fantastic Monday! That's an order. So cute. I love the black squirrel (so strange you have them in Canada but we don't have them in Rochester, since they're really pretty close... maybe they don't cross the Falls, hehe), and of course, my kitty likes to attack any rip (or make rips!) in the sheets too! This little guy was actually in Niagara Falls, NY, so he was in the States! Now it's evern weirder that you don't have them in Rochester! aw, Farva is so cute. great shot of the falls as well! I have -never ever- seen a black squirrel, but long ago in DC I saw an albino squirrel. Super cute! Loving the old camera. I've never seen a black squirrel either! This is weird because I don't actually know him, but I just love Farva. He's so adorable and has so much character. I showed my friend the video of him shaking his paw last weekend and we watched it probably five times! Haha. I've seen thousands of squirrels on two continents and never seen one so dark. What a little cutie. Wonderful pictures! I love the camera photo and the picture of the Falls! I've always wanted to visit, but I just haven't made the 6 hour journey yet. I love the flowers on top of chives. 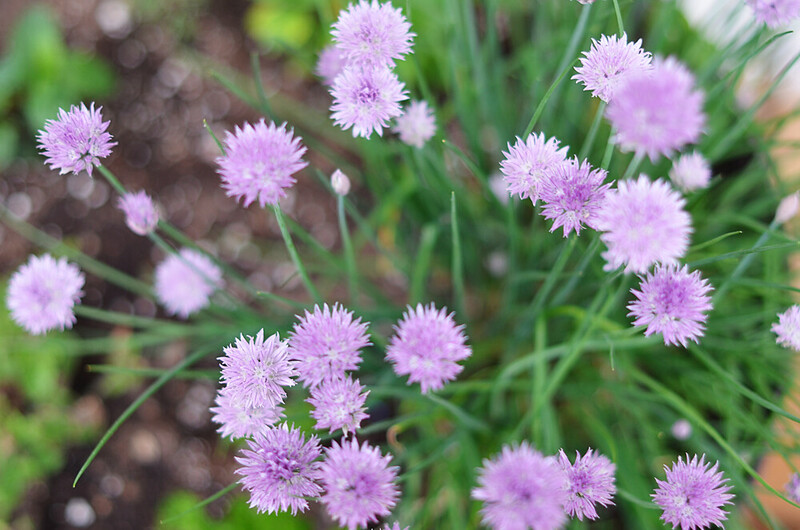 We had chives at my house growing up, and I always loved them. They would make a cool bouquet, come to think of it. It has been nothing but rain here all spring! Worst year German has had since, about, 1841? Ugh. No garden for me this year, I guess. Take your pretties indoors, it's the only thing keeping me sane with all of this rain. The chive flowers are so gorgeous! And I've never seen a black squirrel before; they didn't live in the area I grew up or where I live, now. I hope to be able to catch sight of one on a road trip, one of these days! That squirrel is the cutest. I've never seen a black one before. I didn't even know they existed. I love your Photos :: 365 posts. So many comments about the black squirrel but here's another one. I've never seen a black squirrel! I live in Portland Oregon and we have brown squirrels but if you go RIGHT across the river (literally a 10 minute drive) into Washington State, they have grey squirrels and no brown ones! It's crazy! The chives.... my cat love chives. Have you tried? And a black squirrel so cute! I've lived in a few different parts of the DC suburbs here in Virginia - and in a few places we've had black squirrels... but never in the same places as the grey squirrels (it's always one or the other). I was super surprised to see one the first time, now I see them everywhere. In our current neighborhood, they're really aggressive and it's kind of terrifying. I just want to curl up with Farva - he's such a handsome boy. That squirrel is so cute, I've never seen a black one. I haven't seen many squirrels. Being that lose to the waterfall looks so scary. Farva ALWAYS looks surprised. I love it.